Next month’s Mecum auction event in Kissimmee, Florida will see a miraculously well-preserved classic Shelby Mustang trade hands: a 1966 Shelby GT350 fastback with a believed-to-be-accurate 6,970 miles on the odometer. The car is being offered in near-mint unrestored condition, still wearing its original Ivy Green paint over a black interior, with a factory-stock powertrain and original 10-spoke wheels. This particular Shelby GT350 packs a 3-speed automatic transmission behind its 289-cubic-inch “HiPo” V8, and looking much as it does today, it took second place at a Concours d’Elegance at SAAC 7 in Great Gorge back in 1982. The current owner first spotted the car around that time, at a Shelby meet some time in the 1980s; he tried to buy the car and, after being rebuffed, gave a business card to its then-owner. 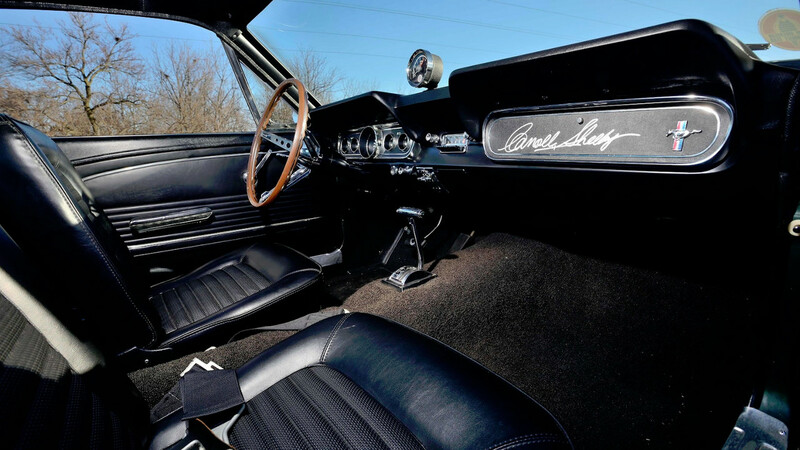 It was about three decades later that that owner used the business card to track down the car’s current steward, offering to sell him the 1966 Shelby GT350 he’d shown an interest in some thirty years prior. This Shelby-registered 1966 Shelby GT350 Mustang fastback might just be the most original first-generation Shelby Mustang in existence, and the car’s anticipated high bid is reflective of that fact; Mecum expects it will fetch between $275k and $375k when it’s auctioned in Kissimmee in January. That’s a small price to pay to be the envy of just about every die-hard Ford or Shelby fan in North America. Check out this Shelby GT350’s listing on Mecum.com for more photos and info.